It’s cold here during our Boston winters, so many people opt for boilers to heat their home; however, forced-air heating systems are an amazing way to heat your home. Furnaces are one of the most common heating systems across the United States for a reason—they’re energy-efficient, dependable units that you can count on when it gets cold. If you’re moving into a new home and installing a heating system, or upgrading your current heating system, consider a forced air heating system. If you need great HVAC services in Boston, MA then contact our team. Forced air heating systems, well, force air throughout your home. In more technical terms, when you hear the term “forced-air” heating system it’s referring to a heating system that warms the home by distributing heated air through your central network of ducts. Forced air systems are different than boilers which use “radiant heating,” meaning that they heat your home through objects. In a boiler system, water travels through pipes and heats a radiator or baseboard heater that then releases heat through the room and raises the temperature of your space. So how does a forced-air heating system help you? We’ve listed some of the best ways below. Forced-air furnaces are extremely efficient. 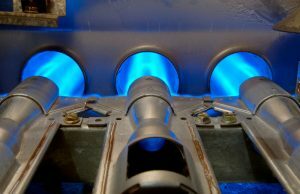 Furnaces have a high AFUE rating around 78-84%. AFUE rating stands for “Annual Fuel Utilization Efficiency.” The higher the AFUE percentage the more heat the furnace can deliver relative to the amount of fuel consumed. A high AFUE rating means that you’ll expend a reasonable amount of energy for the amount of heat you use and save money in the process. Something that makes forced air systems great is that you can filter your air through them. If you install a furnace in your home you can install an air purification system, air filter, or humidifier directly into your furnace system. It’s an effective way to change the air quality of your entire home rather than using small systems that only impact one room in your home. Your indoor air quality is incredibly important to your health, comfort, and your wallet. It’s worthwhile to invest in a great forced-air system for this reason. It’s freezing here in Boston during the winter. When you come home from the cold with a freezing nose and icy fingertips, you’ll want warmth quickly. You can have warmth quickly with a furnace because forced-air heating systems heat your home much faster than other systems. As soon as you set your thermostat and the system switches on there’s warm air rushing into your home. Here at Cooling Unlimited, we recommend forced-air systems and forced-air furnaces in particular. Furnaces can have a high price tag for their initial cost, but the repair, maintenance, and replacement costs are a lot lower than other heating methods. Furnaces are also known for being dependable and long-lasting, so these benefits further offset the initial cost of installation. Looking to install a forced-air heating system? Contact our team here at Cooling Unlimited, Inc. We’ll perform the best HVAC services available in Boston.